Auto Rehab is a vehicle restoration company; we can rebuild anything and everything and any idea is a possibility. Your vehicle can be whatever you want it to be. Auto Rehab has been a dream for many years. Darren's passion has always been classic Volkswagens but this has also spread to any classic car in need of some love and attention. Darren's attention to detail and love for a vehicle means when left in his care it will only gain from the experience as will the owner. 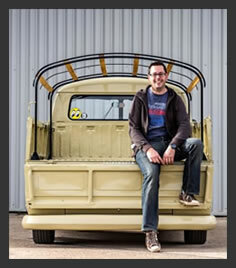 Darren has worked with modern and classic cars for the past 20 years as a panel beater, painter and MOT tester. However, Classic cars have become his niche in recent years with many customers travelling miles to place their vehicles in Auto Rehab's trusted hands. For Darren, Auto Rehab means no more work on modern cars - just days and days of tinkering and perfecting the classics that are his passion. No job is too big or small; all will be undertaken with the same care and attention and we hope you will agree with many of our customers that Darren really does go above and beyond.